* Please note, this section is designed to give you basic product troubleshooting information, also refer to your user manual for more information. Samsung Knox provides security features that enable business and personal content to coexist on the same handset. Knox has a personal home screen and several preinstalled apps. These apps function independently from the apps and content stored outside the KNOX container. 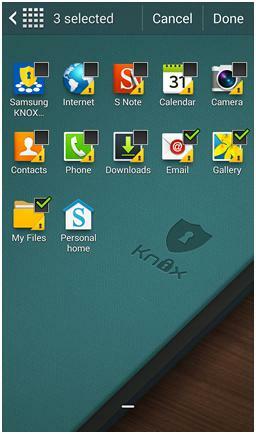 ■ Samsung KNOX apps have been designed and tested for use in Samsung KNOX. ■ You will not be able to access apps from Google Play Store inside the KNOX container. 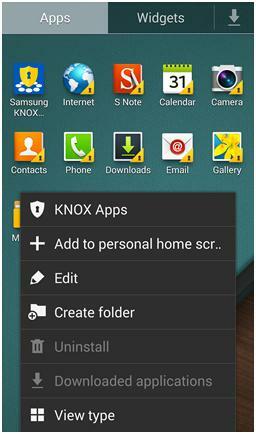 ■ Additional KNOX apps are available only through the Samsung KNOX Apps store. Step 1: Tap Apps then Samsung KNOX . Step 2: Tap Samsung KNOX Apps . Step 3: You can add apps that you install or access in KNOX to your personal Home screen. Step 4: From KNOX tap Apps then Menu then Add to personal home screen. Steps 5: Check the apps you want to add, and then tap Done. ** "To aid us in creating better support content for you, kindly complete the survey below if your query was resolved. Your rating and comments should only be based on the above content. For all other queries or further technical assistance, please call Samsung Customer Care on 0800 726 786 or Live Chat with our Technical Team online, services are open 24 hours, 7 days." How do I use Google Maps to get directions to a specific location?